Any other comments	Owner and driver Jason Martin is a Hawkesbury boy who grew up skiing on the Hawkesbury river at Lower Portland and competed in his first Bridge to Bridge as a skier in 1995 in Weekend Warriors. 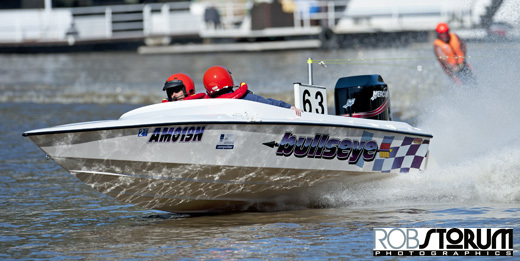 Jason has competed as a skier in all of the classic races over the years and since moving into the boat and purchasing Bullseye is racing in the 60mph class and loving it – except when he “breaks” – exceeding the speed limit ! Observer Natalie Martin is making this year a family event. Natalie is new to the sport as a competitor but has supported Jason in is his racing endeavours for many years. Skier Ryan Dubois is Nowra boy, however grew up skiing on the Hawkesbury at Lower Portland. He was new to ski racing last season and is keen to continue. He is ready to race for another season. Skier Craig Dodge is new to the team this year, however is well known to the crew. Craig is a local Hawkesbury boy as well and has competed as a skier in the Sydney Bridge to Bridge and actually beat Jason one year (a bit of team rivalry !). Craig is also Ryans’s uncle so the team is family friendly !